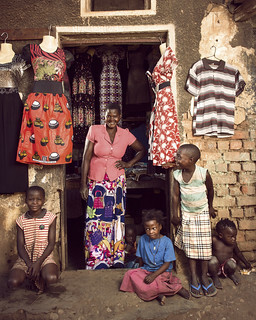 Florence Namatovu, 46, and five of her children fill the entrance to her shop in Mukoko village in central Uganda. Namatovu farms five acres with her husband outside of town in the rolling green hills of Kalungu District. Local norms constrain women, for example to kneel when they greet a man. Yet, Namatovu has an eye on the future. She says every penny she makes goes to support her eight children and put them through school. Lately, she has made extra money of her own growing orange-fleshed sweet potato vines. With her earnings (about $225 a season), Namatovu is considering opening a bank account for the first time in her life.